One of the exciting aspects of high-definition surveying is the wide variety of applications and projects for which the technology can provide genuine benefits. Today, high-definition surveying can be profitably used for many civil/infrastructure projects, certain property surveys, industrial plant projects, heritage and archaeology applications, forensics, buildings and architectural surveys, ships/vessels, mine surveys, feature films, and even tree and vegetation surveys. I have previously detailed versatility factors to look for in laser scanners and point cloud software (see my 3D Scanning columns from the October 2009 and January and March 2010 issues of Professional Surveyor Magazine). The more versatile your scanning tools are, the more applications and projects will be accessible to you. In addition to having versatile tools, your firm can benefit from having or developing complementary expertise in an intended application. This article delves into the “complementary end-use application expertise” side of scanning opportunities. applying this measurement and geo-location expertise to land ownership and development, and to civil infrastructure projects. One fundamental part to this technical expertise is “measurement science” for big stuff and everything that goes along with it: proper use of survey instruments, strong understanding of sources of geospatial measurement error and error analysis, processing survey data into client deliverables, data management and archive, etc. The second traditional area of surveying’s technical expertise is in the applications for which the services are being provided, namely applications in property, boundaries, and civil infrastructure. As obvious as it sounds, surveyors understand property and civil infrastructure terminology. They understand what they’re looking at on a site. They know how to document it for clients. They know how to research these types of projects and how to interpret the information that they dig up. They also tend to know other professionals also engaged in property and land development and civil infrastructure, i.e. they have potential sales contacts. applications for which laser scanning is used. It’s this first bucket where traditional surveying and laser scanning are perfect matches. It’s why most laser scanners are owned by surveying firms or survey departments. They already have the fundamental geospatial measurement expertise and office know-how required for success. In adition, if surveyors apply high-definition surveying to property surveys or to civil infrastructure projects, they also already have this application expertise. They know what they’re looking at on site—from culverts to edges of curb to piers and abutments—and what to scan/survey. Laser scanners are simply valuable tools in the toolbox. It’s the use of laser scanning for applications other than land and civil infrastructure where things get interesting. On one hand, 3D scanning can take surveying professionals into new growth applications and markets. With land development quagmired at historic lows and even some infrastructure funding curtailed, the prospect of new business opportunities is especially enticing. On the other hand, surveying professionals may lack useful expertise in such expansion opportunities as industrial plants, heritage and archaeology, forensics, buildings and architecture, ships/vessels, movie making, etc. Some surveying organizations, however, are very successfully addressing these opportunities. The question is how they do it, and how you can. There are three common ways to add application expertise for non-traditional surveying applications. This is the most common way, primarily for cost and manageability reasons. Its advantages are that no additional expense burdens your company and you don’t have to worry about managing partnerships. Its disadvantages are that this path can be slow for getting to the desired level of expertise that unlocks the full potential of opportunities, and the likelihood of achieving your ultimate goals could be decreased. The primary advantages of this path are instant expertise to offer clients and execute projects, complementary contacts, and low cost. One challenge of this path can be finding the right partner(s) that work well with your firm. Partnerships can be terrific—successful partnerships abound in the laser scanning business today—but they need care and nurturing like any good partnership. A good source of candidate partners is your laser scanner and software vendor. Your vendor should know which firms have the desired complementary expertise, which are actively looking for or are open to partners, and which have earned a reputation as being good partners. The advantages of hiring complementary expertise are speed-to-market and speed-to-optimal-project execution. The main disadvantage is the added expense. Some mitigate this by starting with part-time services that can turn into full-time services as new business pans out. A speaker at a laser scanner and software vendor’s 2009 user conference coined the term “vertical real estate” in referring to how his surveying firm was taking advantage of laser scanning for surveying and documenting celltowers. I like how the term connects to the traditional meaning of real estate. The speaker explained that owners of cell towers lease tower space to various service providers. As the world goes increasingly mobile, existing towers have more antennas crammed into fewer open spaces, plus it’s increasingly important that antennas are accurately aimed for optimal coverage. Another trend: Towers often change ownership, and on-site changes are not well documented. To meet the demand for accurate documentation of cell towers, including use of the information by tower owners for better management of their vertical real estate, Star Net Geomatics, a surveying company based in the United Kingdon, combined their laser scanners and software with basic surveying expertise plus expertise in cell tower design/construction. Just as a civil/survey firm may have staff with experts in roads and bridges, Star Net employs experts in cell towers. That staff can identify types of antenna connections, types of structural bracing, and a host of details specific to cell towers. They know what they’re looking at when they survey a cell tower, they know how to document it, they know how to communicate with cell tower clients, and they know how to provide client deliverables. Today, this successful, growing survey company owns three laser scanners and has millions of dollars worth of high-definition surveying service contracts for cell towers as part of their overall survey business. In the United Kingdom, where traditional American-style land development has been almost nil for decades, “building surveying” is a major part of the surveying profession; estimates peg it as high as one-third of all surveying services there. Again, it’s the vertical real estate notion: Space is so precious, and existing buildings (especially historical ones) are so highly valued that surveying them for modifications or leasing needs is big business. With the strong industry trend in the United States and elsewhere to building information modeling (BIM), there is a significant opportunity to document buildings inside and out in unprecedented detail. It’s my observation that American surveyors often know something about buildings but not nearly as much as the business opportunity for laser scanning of buildings invites. Two user examples come quickly to mind. 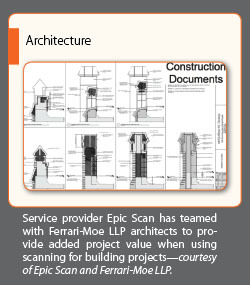 At an October 2010 conference on high-definition surveying, one joint presentation was by a team comprised of a very successful surveying/scanning service provider (Epic Scan) and their architect client (Ferrari-Moe LLP). The presentation detailed how high-definition surveying is today being used on all of the architect’s projects and at all stages of the project: proposal, site inspection, initial and detailed design, bid documents, and construction and fabrication documentation. The combined expertise of the scanning/survey service provider and the architect enables the two firms to mine the market with maximum benefits. A second example is Architectural Resource Consultants from California. They are not a surveying firm but are nevertheless an interesting reference for this discussion. 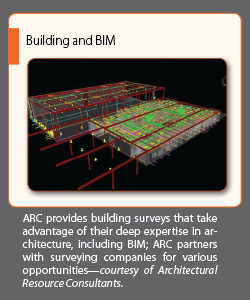 ARC is comprised of architects and technicians who do mainly building surveys. They work with surveyors for site control and related surveying needs, but primarily they provide scanning services on their own. A large part of their client value is their deep knowledge of buildings and how they are constructed and operate. When they scan a building, they know what they’re looking at, they know the relevant detailed terminology, and they can communicate effectively with architects, engineers, building contractors, and building owners. ARC recently told conference attendees that even though commercial building construction is off, scanning had helped them stay in business by bringing in new clients and applications, many of which derive from the BIM trend. They are a good example of a firm open to partnering with surveying organizations that may have candidate architectural, engineering, or building contractor contacts but may lack in-depth expertise in buildings and architecture to take full advantage of these contacts. Many other application examples come to mind. At the same October 2010 conference, Gabriel Callari of ABI Group in Belgium told attendees that his then new, two-person survey firm (they had purchased a sales demo scanner at the time) secured a good as-built project at a steel mill and teamed with a plant-modeling-services company to provide deliverables. ABI Group has since grown successfully and upgraded to a new scanner. The RLS Group in Tennessee also successfully added plant and facility as-built surveys to their survey service offerings. In their case, they learned on the fly as they executed their first plant and facility projects. Some early plant as-built opportunities came from local contacts and some via referrals from their scanner and software vendor. Over time, the company has developed strong expertise in these applications and many reference clients. Today the company owns two scanners. LandAir Surveying in Georgia has likewise successfully developed scanning business and expertise on the fly for mechanical, electrical, plumbing (MEP) as-builts to help pick up the slack in traditional surveying. Some MEP as-built opportunities have come from the BIM and 3D design trends sweeping through these disciplines. LandAir has also teamed with The Beck Group, headquartered in Texas, for some new architectural survey opportunities. 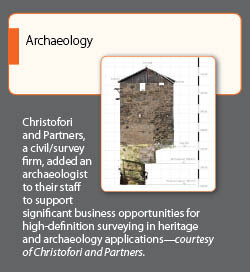 Christofori and Partners in Germany is a terrific example of how a civil/survey firm has built a significant business in applying their laser scanners for heritage and archeological applications. They learned these new markets on the fly and also partnered with an appropriate expert; over time the company added an archaeologist to its staff. Today the company has three laser scanners, and more than 70% of their high-definition surveying services are provided in the heritage and archaeology space. Forensics is yet another laser-scanning-application area where having access to expertise in the application can pay good dividends. Here, firms have taken advantage of former police agency staff to secure contacts for forensic opportunities. 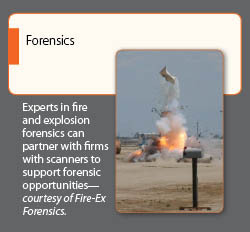 Likewise, some surveying firms with scanners have partnered with forensic engineering or forensic simulation specialists to exploit opportunities in this space. For many survey firms, laser scanning represents an opportunity to leverage fundamental survey knowhow into new applications. In addition to having versatile scanners and software to address a wide variety of applications, it can also be beneficial to have complementary expertise in the intended applications. There are multiple ways to gain complementary application expertise, including ways that minimize risk and cost. Today, there are many examples of traditional surveying organizations that have added this expertise to achieve excellent success in expanding their business.